A fox rehabbed with The Canid Project is photographed about a month after its release. Courtesy Amy Shutt. Two red foxes brought Amy Shutt back to life. After initially deciding to study photography at LSU, she switched gears to pursue a degree in philosophy instead. By spring 2007, she had barely touched her camera in three years. She was 32, living near the LSU lakes with her then 11-year-old daughter Logan and running an online retail business. One day, Shutt was driving home with her daughter when she exclaimed, “Mom, I think I just saw a fox!” It had popped its copper head up out of a drainage pipe in a ditch near their home. Shutt had only seen one fox in real life before, back when she was a teenager. She went home to grab her simple point-and-shoot camera. 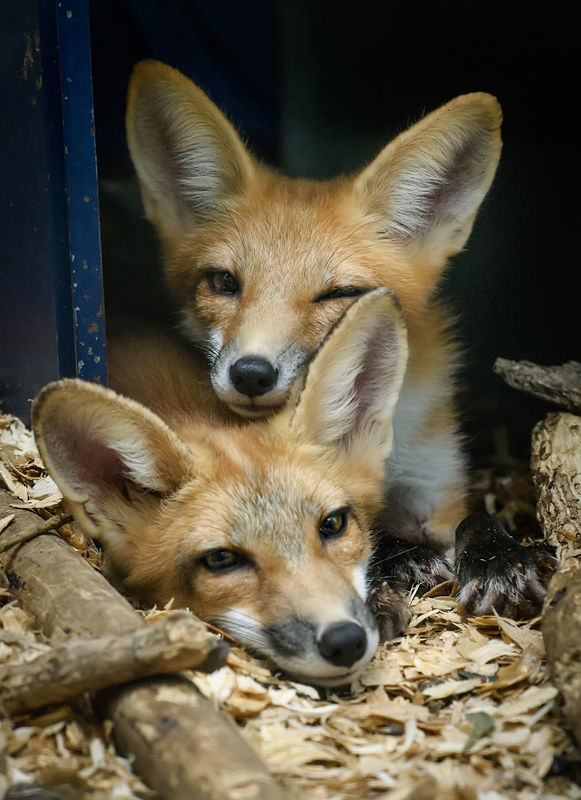 Two unrelated 5-month-old foxes were cared for together in the rehab program. “They bonded from the start and became partners in crime immediately,” The Canid Project’s Amy Shutt says. That day, she snapped photos for the first time in a long time—of the adult female fox as well as its tiny fox kit. Shutt and her daughter began watching the family often during sunsets. To her, it was magic. They were magic. She never put her camera down after that. Now 43, she lives the life of a full-time photographer, including as a contributing photographer for 225. She happily traverses the globe, from Baton Rouge to Prince Edward Island to Kenya, taking photos of the wildlife in each locale. She decided to officially blend her passions for photography and foxes early last year with The Canid Project, a venture combining rehabilitation and wildlife science with photography and writing. Much of the wildlife she photographs, particularly in Baton Rouge and on Prince Edward Island, is red and gray foxes. During these excursions, she’s met other photographers and conservationists she says she wouldn’t have met otherwise if it weren’t for the canids uniting them. She realized then that photos were only one part of the canid story. Since 2007, Shutt has been assisting with wildlife rehab as a volunteer with the wildlife sanctuary Wings of Hope in Livingston Parish. Last year, she got her own official rehab license with the Louisiana Department of Wildlife and Fisheries and began rehabbing foxes independently. Imprinted on her memories are the five 8-week-old orphaned red fox kits she recently rehabilitated. Three of them were siblings from one litter. A nuisance wildlife operator had received a complaint about them in a residential area. He tried to trap the litter with the mother, but the mother and another kit escaped, leaving the three babies alone. Another fox kit was found sick in the middle of a road. One more young fox was confiscated from someone attempting to sell it. All of them were brought to Shutt. 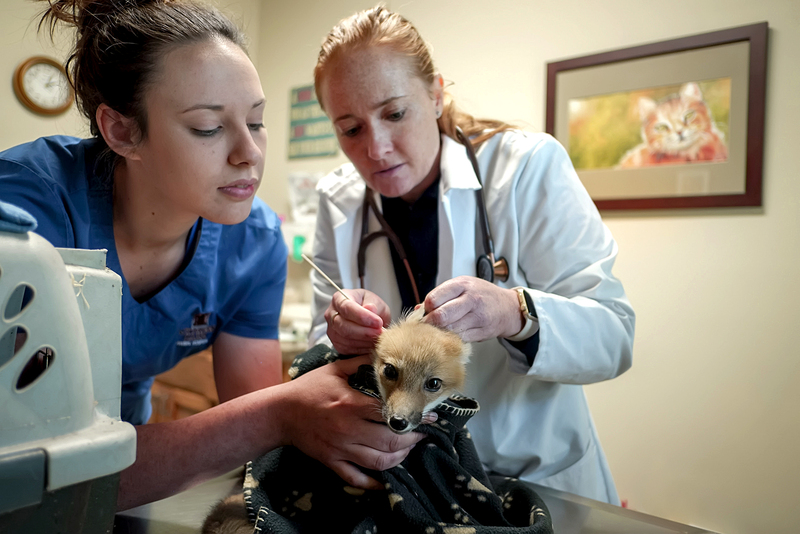 Technician Ashley Cochran and Dr. Kristin Kulinski of Cypress Lake Veterinary Hospital check a young fox for ear mites during an exam. Courtesy Amy Shutt. She cared for them in her facility on the outskirts of Baton Rouge. When they were 6 to 8 months old, she released the foxes into the woods of nearby St. Gabriel, where she had set up trail cameras to document their recoveries for as long as they remained in the area. She registered her work with Wildlife and Fisheries as well, making her program the only one to provide species-specific fox rehabilitation in the state. She can also rehab coyotes. After setting up the rehabilitation facility, she put together her own team of fellow photographers, biologists and conservationists, many of whom she had met through photography adventures, and launched The Canid Project in December 2016. The project was approved for nonprofit status in October of last year. As the director, Shutt is aiming to promote wildlife conservation through photography and educational community outreach. 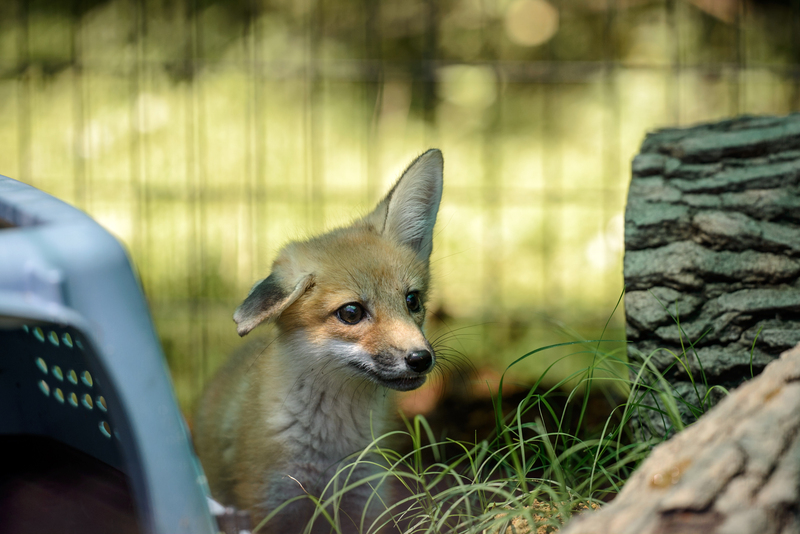 While rehabilitation is essential to keeping orphaned and injured foxes and kits alive, photography also contributes greatly to that cause through awareness, Shutt says. Intimate wildlife photography can give people an understanding that they otherwise wouldn’t have about the teeming wildlife right in their backyards. Shutt’s been doing everything from photographing resident foxes around Baton Rouge to going door-to-door helping educate residents who have discovered fox families living underneath their homes. It’s been 10 years since that red fox and her kit near the LSU lakes changed Shutt’s trajectory. She pushes on with The Canid Project, her way of trying to give back to them the only way she can: creating a distinctive new wave of conservation for the state. Those foxes took hold of her spirit that spring day. They’ve yet to let go. • Give it ample space. They can be curious but are rarely aggressive unless threatened. It’s a wild animal, after all. • Don’t try to feed foxes. They hunt for food—usually small rodents—and putting out food only attracts other wild animals. • Keep your pets on leashes or in secured enclosures. Close openings under porches or sheds, where foxes might make a home. Learn more and find The Canid Project online at thecanidproject.com.